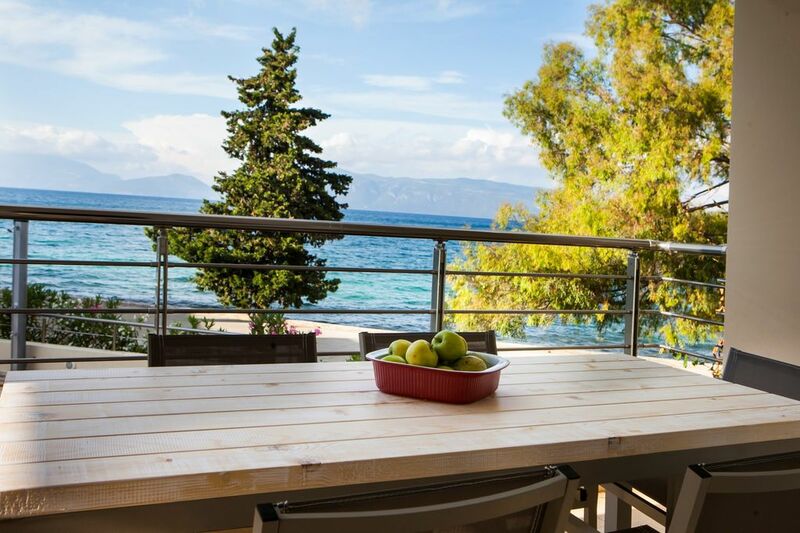 At only 10 meters from the Ionian sea, Condo Elia is perfect for those seeking a quiet, relaxing holiday. Currently at our 6th year of business, we have enjoyed consistent compliments and high rated reviews from our clients. Please note the photographs provided are all true to form. Condo Elia features a modern and tasteful decor whilst retaining a warm and homely feel.The ground floor, spread across a generous 67m2, features 2 large double bedrooms and two bathrooms. All of the bedrooms feature built in wardrobes for ample storage space. The second bedroom can convert to a twin room if required. The first floor, covering 60m2, is the open plan kitchen -dining and living area. Patio doors lead out to the private balcony, where there is also a dining table and seating for 6, all enjoying excellent sea front views. The kitchen includes a dishwasher, full oven and hobs, coffee machine, kettle, microwave, toaster and all the necessary equipment to make this maisonette your home away from home. The living area also includes a sofa bed, this splits into 2 single beds, and also a dining area that also seats 6. Air conditioning, TV and Wifi are included as standard. We also provide full apartment cleaning twice per week, including fresh towel and bedding replacement. The development includes a communal, unheated swimming pool, with sea views and underwater lighting. Car parking is available around the whole development. A small pebble beach is available only 10 meters from the complex, a larger organised beach (Karavomylos Beach) is a 10 minute walk. Upon arrival, the onsite manager will introduce you to the apartment. Please note the standard check-in time of 14:00, and check-out time of 11:00. A 150 Euro cash damage deposit will be required at the time of arrival, and will be refunded at your departure, subject to an apartment inspection. The on site manager, available on a 24/7 basis, will be expecting you to welcome you, provide you with refreshments and show you into the property. A tour of the complex will include details of places to visit, directions and any other help required. We also organise taxi transfers and car hire at favourable rates for our guests and can recommend car hire options. We stayed at Condo Elia for 4 nights at the end of August 2018. We were met on arrival by Harry, our friendly informative host, he made us feel very welcome spending time to give us information about the apartment and local area. The apartment was very comfortable, spotlessly clean with everything provided to the last detail in the kitchen and bathrooms, the beds and sofas were also very comfortable. Our welcome pack included wine, handmade biscuits and jam, all excellent quality. The apartment is in a lovely position so close to the water's edge, we swam in the sea there as well as the pool. The well furnished shady verandah is comfortable for eating and reading, it does not get direct sun but other apartments in the complex do. We drove into Sami in the evenings, 5 - 10 minutes drive with easy parking. There is a good selection of tavernas with inexpensive meals and wine. We thoroughly enjoyed our stay at Condo Elia, Karavomylos and would like to stay there again when we return to the area. From the start, communications were perfect and all queries answered promptly, including information about the resort. We were met by the apartments manager upon arrival and given a 'tour' of the apartment. He was exceptionally pleasant and very helpful. The accommodation was lovely, well decorated and furnished and kept very clean. Really liked that bikes were provided for our use. Best though was the sea view- just incredible. The manager was on hand throughout our stay and did a fantastic job in looking after us. Would thoroughly recommend. Good sized apartment lovely and clean. We walked into Sami a few times down the beach only took 20 minutes and a bar on the way. Also a 5 star hotel a couple of hundred metres away with lovely big pool which we used a few days as bought drinks at the bar. Our family of 5 stayed at this unit and had plenty of room. Our manager Harry greeting us upon arrival. There were some refreshments available upon our arrival; a welcome sight at 11:30 PM after 24 hours of travel! The well equipped kitchen and living area are on he upper level. Bedrooms were on the lower part (partial basement) of this unit and tended to be very damp feeling; we did finally remedy this by turning the heat on a bit to dry out the rooms. Was great to have a very small washer although clothes came out quite wet. Dry racks available. Ein sehr tolles Apartment direkt an einen kleinen Kieselstrand. Wir waren vier Nächte vor Ort und waren mit allem sehr zufrieden. Wir wurden persönlich von den Vermietern empfangen und haben viele Tipps für die kommenden Tage bekommen. Vor allem die Tipps für Strände und Restaurants waren sehr hilfreich. Die Wohnung ist gut eingerichtet mit allem was man benötigt. Der Balkon ist zwar nicht auf Süden ausgerichtet, für uns war das aber ideal. Da wir noch in der Vorsaison da waren hatten wir den Pool für uns ganz alleine. Die gesamte Anlage ist sehr gepflegt und sauber. Die Straße zwischen den Appartements und dem Kieselstrand ist sehr ruhig, es waren kaum Autos, so dass man vom Balkon das Meerrauschen genießen kann. Sauber, schön , super Service !! Within walking distance, there are two traditional taverns, a mini-market, a bakery and a church. The nearest town is Sami, a few minutes drive, or a 20 minute walk along the coast. A traditional port town, with many tavernas and bars, as well as supermarkets, butcheries, green grocers, bakeries, pharmacy, souvenir shops, ATM, medical centre; and all the other essentials for a comfortable stay. Also within a very short distance from the development are public tennis courts, basket ball court and an astro-turf 5 a'side football pitch. Due to its central location on the Island, few of the many places to visit are more than an hour's drive away. This includes Fiskardo to the north (1 hour), the famous Myrtos beach (30 mins drive) Skala (45 mins drive) the capital Argostoli (40 mins drive) and the airport (50 mins drive). Also available across the island are various activities, including but not limited to Horse Riding, Snorkeling, Kayaking, Swimming, Wine Tasting, Water Sports, Boat Rental and Fishing.